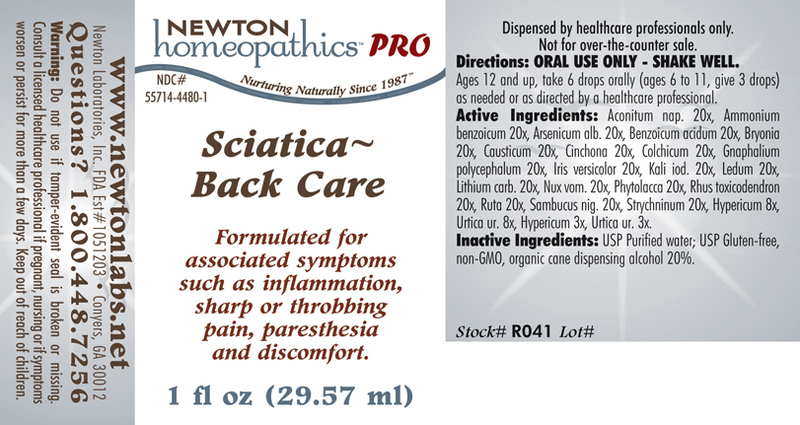 Sciatica~Back Care Formulated for associated symptoms such as inflammation, sharp or throbbing pain, paresthesia and discomfort. Directions: ORAL USE ONLY - SHAKE WELL. Ages 12 and up, take 6 drops orally (ages 6 to 11, give 3 drops) as needed or as directed by a healthcare professional. Aconitum nap. 20x, Ammonium benzoicum 20x, Arsenicum alb. 20x, Benzoicum acidum 20x, Bryonia 20x, Causticum 20x, Cinchona 20x, Colchicum 20x, Gnaphalium polycephalum 20x, Iris versicolor 20x, Kali iod. 20x, Ledum 20x, Lithium carb. 20x, Nux vom. 20x, Phytolacca 20x, Rhus toxicodendron 20x, Ruta 20x, Sambucus nig. 20x, Strychninum 20x, Hypericum 8x, Urtica ur. 8x, Hypericum 3x, Urtica ur. 3x. Formulated for associated symptoms such as inflammation, sharp or throbbing pain, paresthesia and discomfort.